National Ag Day March 25, 2014 coincided with the celebration of Dr. Norman Borlaug’s (1914-2009) 100th Birthday. Online this celebration was known as #Borlaug100. Offline this included the Borlaug Summit on Wheat for Food Security in Obregon Mexico. 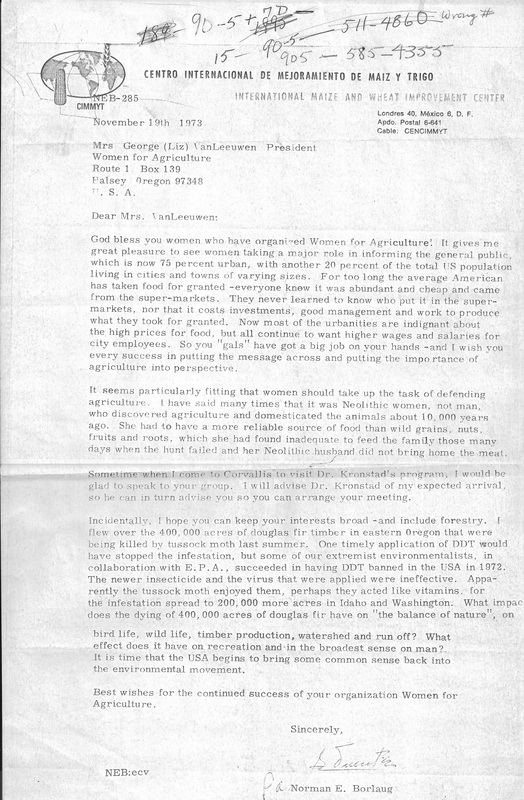 Oregon Women for Agriculture (OWA) has a history with Dr. Borlaug as can be seen in the letter (included) from November 1973. 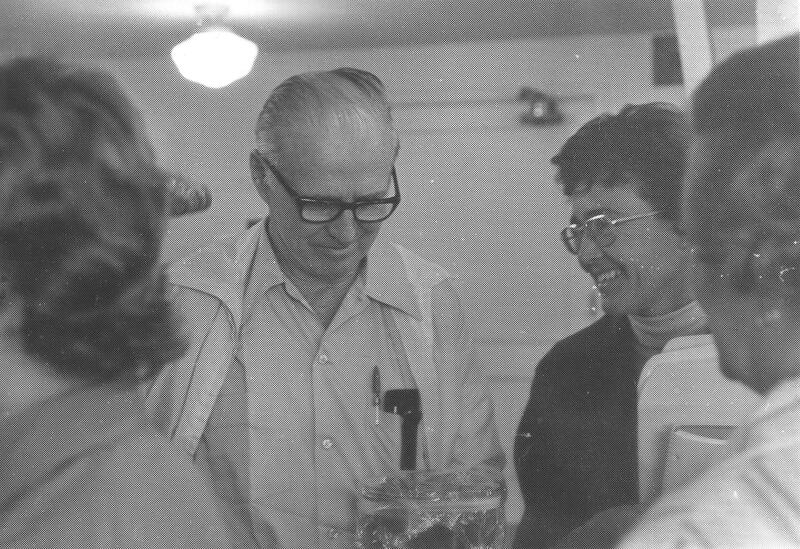 Oregon Women for Agriculture helped bring Dr. Borlaug to Oregon in 1977, “Belonging to organizations interested in better public relations between agriculture and the general public- Oregon Women for Agriculture, Oregon Farm Bureau and American Agri-Women- the small group was granted an opportunity to personally meet with Dr. Borlaug and Dr. Anderson, as well as the OSU CIMMYT team.” The Times July 14, 1977. Previously in April 1974 OWA and Oregon State University (OSU) faculty Dr. Warren Kronstad helped organize a trip of members, legislators, extension personal and wheat commission representatives (more than 50 people total from Oregon and Washington) to the CIMMYT station in Obregon Mexico for a tour during their annual field days. The transcript of a radio news broadcast of the visit reports “One of the most impressive things to me was the absolute spirit of dedication and team work unconsciously displayed by these highly educated plant breeders; and the meticulous, methodical, tedious record keeping system that is essential to such a large-scale experimental program to develop high yielding, more protein content and greater disease resistance in these grains.” Liz VanLeeuwen on the KWIL Mid-Valley Farm Report May 3, 1974. Again in 1980 OWA was there when Dr. Borlaug was the speaker for the OSU Ag Honors Dinner. Notes taken that night on the back of the program talk about how the total yield in 1970 would have taken double the land if we had still been using 1940’s technology. 1980 Dr. Borlaug meeting Liz VanLeeuwen and granddaughter Arwen McGilvra (then 2 years old) at OSU. “Without a political and technological commitment to agriculture, the world will go hungry.” Corvallis Gazzette Times March 25, 1980 (Dr. Borlaug’s 66th birthday.) This is the message that National Agriculture Day is still working to tell people. Authors Note: This bit of our history might have been forgotten if it were not for those like my Grandmother who kept the letters, photos, articles, and other pieces of interest. I rescued them from the file in her basement and am working on making sure they are digitally saved. Our history is important, save it because you never know when it will come around again.